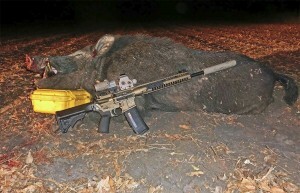 A Large Hog taken with the LWRC 6.8SPC AR15. Twice a year a local soybean farmer calls me to help him with his hog problem. Early spring for the planting, and late August right after the harvest. One field, in particular, receives heavy damage every year, as it is located less than one hundred yards from a major river and hog highway. This was the field I would be hunting tonight. For this year’s harvest hunt I brought the perfect hog slaying combination, a suppressed LWRC Six8 limited edition Razorback AR15 rifle, shooting Hornady 120 grain SST ammunition. Since hogs are mostly nocturnal, and even more so in the Texas August heat, this would be a night hunt using night vision and thermal optics. Wanting to try different things on the LWRC, I started the hunt using a 3rd generation PVS-14 Monocular mounted behind an EOTech Holographic sight. Then, later in the night after all moon was lost, I switched to the W1000 Thermal scope. Two Boars down with the 6.8SPC! Although I have taken many hogs with the 6.8SPC, this was my first hunt using the Razorback and the field mentioned above would be the perfect testing grounds! This particular field is two thousand yards wide and one thousand yards long, consisting of flat ground with no cover, sprinkled with one of hogs favorite treats, soybeans! There was a steady wind from the Northeast, so soon as the sun went down I positioned myself downwind on the Southwest corner. It did not take long for the first sounder of hogs to appear. It was a group of ten, with two sows and eight piglets about 900 yards from my position. As I closed the gap, under the cover of darkness a pair of boars emerged between myself and the sounder of hogs. The two boars were feeding as they moved towards me, so I set up my shooting sticks and waited for them. At fifty yards I picked the farthest one and let a 120 grain SST fly. The suppressed 6.8’s report sounded like a .22 long rifle and I heard the bullet flying through the wind with a rewarding THUMP as the first hog went down without even a twitch. The second boar turned to look at the first, giving me a perfect broadside shot. He also went down in his tracks! As I looked into the darkness the original sounder was still feeding just 300 yards past the two boars. 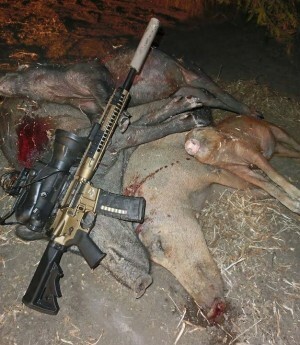 The stalk was back on and the scenario repeated itself throughout the night, with me and the LWRC Six8 Razorback AR15 rifle taking fifteen hogs that first night after the harvest. It was a true after harvest, nighttime hog hunt with the 6.8SPC! A final tally of 15 hogs taken on the first night of harvest. 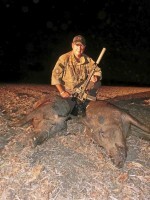 Todd Huey (aka: Texas Lawman) is the owner of the Lone Star Boars hunting forum and YouTube Channel. 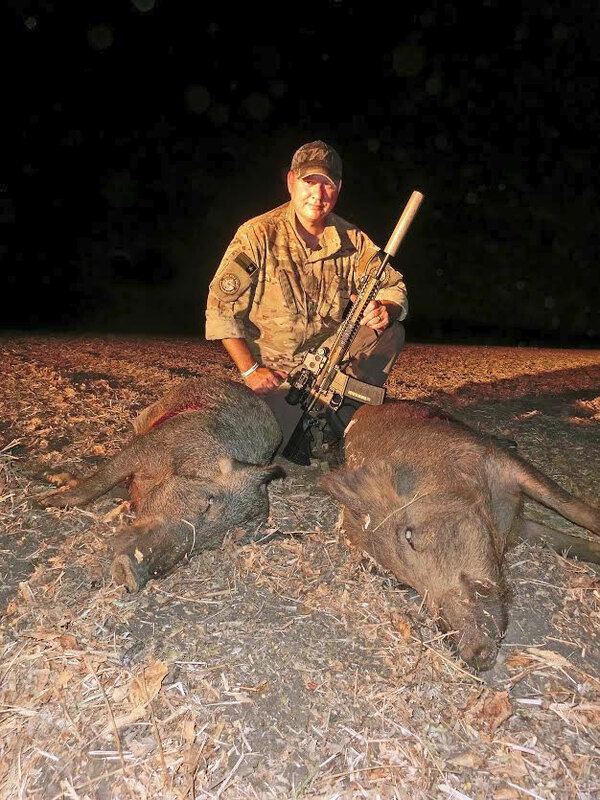 Todd is an experienced hunter who is well-versed in the use of night vision, thermal optics and suppressed rifles to help landowners protect their crops by killing 100s of hogs every year. He also documents his hunts on video, to help educate other hunters on habits of wild hogs and the equipment used to hunt them.